HomeBlogPico – The World’s Smallest Arduino 328PB Core. Pico – The World’s Smallest Arduino 328PB Core. 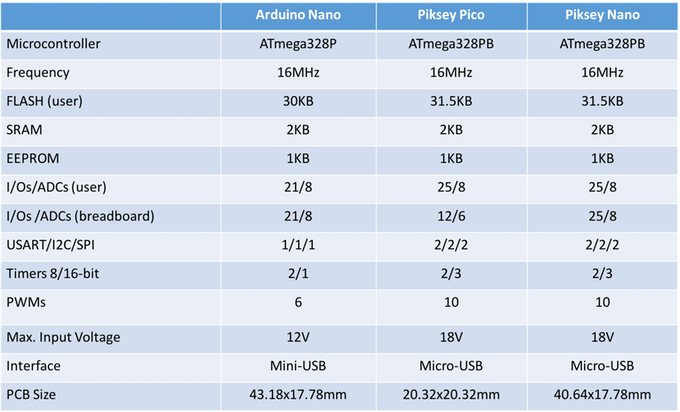 The Pico is still the smallest Arduino development board on the planet, at 20.32×20.32mm. It’s breadboard compatible, and offers roughly the same amount of flash (31.5/32Kb), 1Kb of EEPROM, and 2Kb of onboard SRAM. You’ll also find the same 18V max input, tactile reset switch, micro USB, and LED indicators. The most significant addition, though, has to go to the 328PB’s onboard capacitive-sensing hardware, specifically a Microchip QTouch PTC (8-bit AVR), which allows you to run capacitive touch buttons without the need for additional ICs and supports both self (up to 24 buttons) and mutual (up to 144 buttons) capacitance sensors.